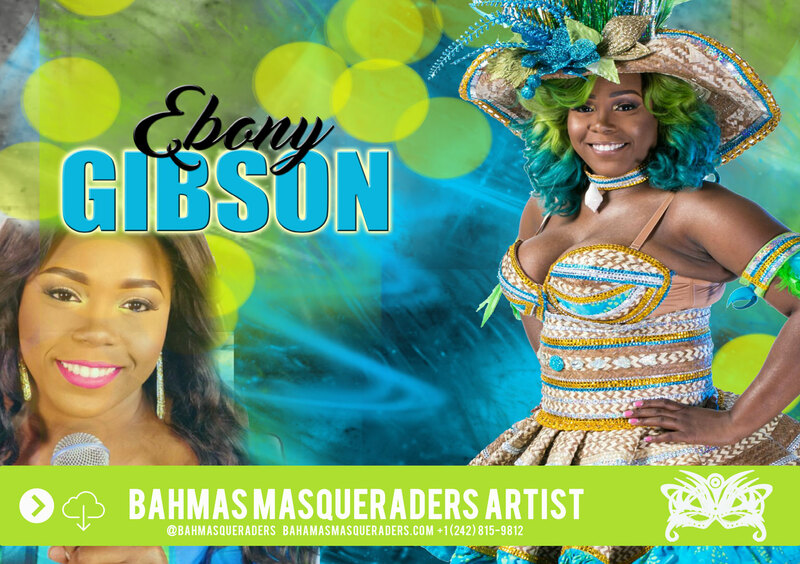 Ebony Gibson is a Bahamian Entertainer with an unforgettable stage presence that encompasses unique style, powerhouse vocals and a passion for Bahamian culture that is evident the minute she hits the stage. An accomplished singer and musician, Ebony’s musical roots began with her singing praise and worship songs in church, which led to lessons in both the piano and saxophone. A true lover and advocate of the traditional sounds of Bahamian music – Rake ‘n’ Scrape and Junkanoo – Ebony has spent years perfecting her craft as a vocalist with The Falcon Band and The Sky Juice Band performing at Cultural Festivals and events throughout New Providence and The Bahama Islands. Ebony presently performs with her own band The Blue Connection, and as is a member of the Royal Bahamas Defence Force navy where she is lead vocalist and saxophonist with the legendary The Royal Bahamas Defence Band. Ebony proudly attributes her love for Bahamian music to the inspiration she received from the late Bahamian songstress Terez Hepburn, who encouraged young Ebony to follow her dream to become an entertainer. To this day, Ebony continues to pay homage to the memory of Terez by performing one of the late singer’s popular songs, the crowd favorite “Mr. Bus Driver”. An unparalleled Bahamian diva, Ebony is known for her signature style of vibrant hair and bold costumes that are expertly crafted with elements of Bahamian culture such as the handmade Bahama Batik fabric which she accessorizes with feathers and indigenous straw material. Ebony has rapidly positioned herself as “one to watch” among the emerging faces of female entertainers within the Bahamian music scene. A semifinalist and finalist in the 2016 Bahamas Junkanoo Carnival Music Masters Song Competition with her song “Block Da Road”, a highly requested radio favorite throughout The Bahamas, Ebony has proven that her blend of powerful vocals, Rake ‘n’ Scrape and Junkanoo can entice listeners of all ages, as she boldly endeavours to keep Bahamian Culture alive through her music. In 2017, Ebony once again captured a spot in the semifinals of the Bahamas Junkanoo Carnival Music Masters Song Competition with her song ‘Road Survivor”. Fans of her popular songs “I Ga Need Dat Lil Ting” and “Rock My Boat” can once again look forward to the signature Ebony Gibson sound and a performance fully accented with flamboyant costumes and riveting vocals.